Healthy Ramadan Smoothie – Hello Holy Days! If you haven’t heard by now, Ramadan has a set of colours. (An explanation on that here.) When even our food is made to represent holiday colours it makes the holiday feel extra festive and fun, particularly for little kids. 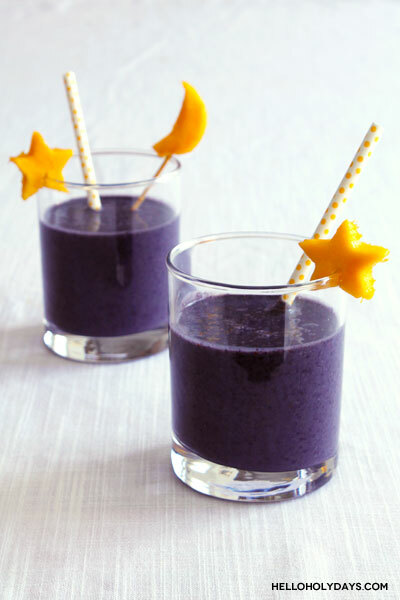 To embrace the purple and yellow colours of Ramadan, make this healthy Ramadan smoothie featuring blueberries (purple) and mango (yellow). Place all the ingredients except for the mango in a blender and blend on high speed until smooth. Adjust any ingredients based off your own individual taste and pour into glasses. Make a small indent on the star with a knife and place it on the rim of the glass for a festive topper. 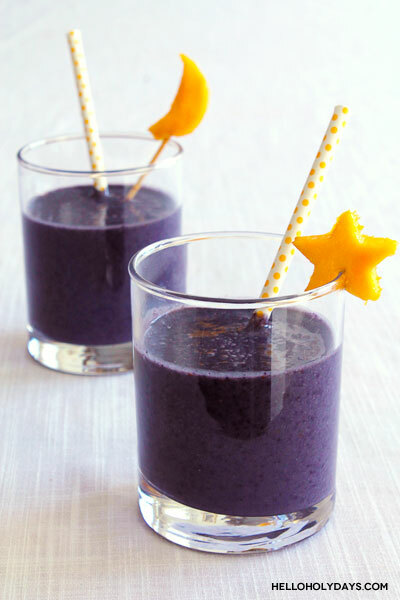 For the moon, insert it onto a bamboo stick to make a swizzle stick to place in your smoothie. Finish with yellow straws and serve. This recipe makes enough for 2 small servings or 1 large serving.